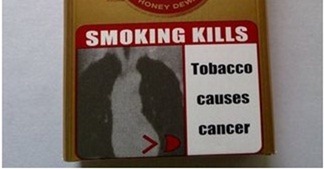 Tobacco products will now come with graphic warnings...really graphic! Tobacco products will now come with graphic warnings…really graphic! If you smoke or consume tobacco in any form, be ready to get shocked every time you open a new cigarette packet or tobacco pouch – India’s Union Minister for Health and Family Welfare has, in a notification, made it mandatory to use graphic warnings on all tobacco products packages. According to press release, these warning will come to effect from 1st December 2011. These are the kind of warnings that come on all cigarette packers as well all smokeless tobacco pouches. These too be honest are quite strong – But, it looks like introduction of even such strong warnings also have not deterred tobacco users. As per the recent Global Adult Tobacco Survey (GATS) India Report, here are some of the highlights of tobacco users in India. Current cigarette smokers: 5.7% of adults: 10.3% of males and 0.8% of females. Current bidi smokers: 9.2% of adults: 16.0% of males and 1.9% of females. Current users of smokeless tobacco: 25.9% of adults: 32.9% of males and 18.4% of females. These are startling figures – One Indian in every 3 either smokes or consumes tobacco in some or the other form ! Now, what I want to ask readers is – Will these warnings have the desired effect and dissuade tobacco users from using them? And, also it will be interesting to see how, tobacco companies will react to this particular notification ! Who cares for these warnings? I don’t think people who consume tobacco products least care for them. They always have an excuse ready for you. A guy I met said that tobacco gives relief from bleeding gums. There was another guy who said that he spits the tobacco in exactly 3 minutes. According to his research tobacco has a bad impact only after 3 minutes. Therefore, piney aur khaney walon ko kya warning dikha rahe ho; they are more interested in what’s inside than what’s on the packet. I believe that children should be brought up in a way that they think smoking/drinking is equivalent to bad habits like stealing/taking drugs. Also it has a lot to do with parents, whether they smoke or not. My father never did and hence it was easy for him to make an impression that smoking/drinking is not something we should take up after we grow up. So if anyone who smokes takes a pledge that they will stop it after they have kids and if they are able to impart right ethics then this prob can be solvd specially in middle/upper and upper middle class. 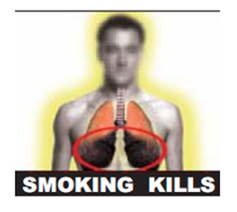 Tobacco products will now come with graphic warnings…really graphic!“Smoking Kills”. “Smoking is injurious to your health”. Well its a good question. As a smoker, I ask myself many times “why am I smoking?’ To be fair, I have no answer. Many of my good wishers tried to convince me how much loss it is causing to me. Well I agree with all of them, sincerely. But in the tension, I go out and start a smoke. When I started smoking at the age of 16, it was fun. We were just out of school and tasted freedom in college and smoking made us beleive that we are really free and really grown up. What started as fun has become a habit. A habit!! Thats the answer to the question. I smoke because it has become a habit. I fully agree when people tell me that in the long run, I will get cancer. I fully agree when people give me simple math that at a rate of 20 cigerettes a day costing 100 rupees, I am spending about 30 to 40 tousand a year on cigerettes which can be better used on my family. Please note that I tried to stop. Many of my fortunate friends succeeded too. Some of us have failed to stop. May be my will is not so strong. So I gave up. I gave up on trying. If I tell people here “Please do not start smoking because it becomes habit’, they will think I am giving lecture. As a smoker, I have no moral right to request anyone to either stop smoking (to those who smoke) or not to start smoking (for those young ones). But going through what I did I request people, specially young ones not to go into smoking. First it will be fun. Slowly it becomes habit BEFORE YOU REALISE. You do not only pose a danger to your health, and spend money on that, it causes bad breath which unless you take utmost precautions like brushing your teeth everytime you smoke or keep chewing gum, your friends and family keep a distance from you. There are some herbal remedies available but now that I am so tired of trying I thought I will go through with this and see when my doctor announces the bad news. Now coming to the efforts of govt to increase the visual effects on packs, it is only cosmetic. In Singapore the same pack of cigerettes costs 12 times that in India. So people smoke sparingly and some stop just becasue of financial reasons. Eitehr you ban cigerettes or allow it. Increasing graphic content on packs will not do anything. Slowly people will get used to the content and keep smoking casually. If govt bans cigerettes, my first reaction will be to fight the injustice, people like me will make it a legal issue, ban on freedom etc etc and then try to find smuggled cigerettes and when that too becomes difficult we will stop, but still be angry. However I am against some people behaving like they are above others. Airlines have now stopped smoking completely during flight. Why should we be discriminated against non smokers? Imagine a smoker to feel torture for 20 hours if he is flying to US or Canada. What the airline is acheiving? Are they trying to reform smokers? It is none of their business. If they want to protect non smokers, they can have seperate cabins for both. Stopping a smoker for 20 hours and feel they are doing service to mankind is a lousy approach. I work in Industrial projects. In construction sites of Oil and gas, it is highly dangerous to play with fire. Even in such places, we have smoking shelters. Just the knowledge that the smoking shelter is ther when I want to smoke relaxes me. If there are no smoking shelters, people will smoke in some unseen corners and eventually cause fires. Even airports have a seperate area for smoking. Airlines should learn from Industry. What really surprised me was that “1 in 3 people consume tobacco in one form or the other” – This is just too high a ratio. lollllll….. well it SHOULD be ‘really’ graphic ………. :) !